2014 Buick Regal Pros and Cons: Why (Not) This Car? Legend has it that General Motors once successfully fielded a hierarchy of five brands, each one catering to a separate stratum of buyers. People would start with Chevrolet then move up as their careers progressed, with the most successful ultimately buying Buicks then Cadillacs. Two of the five rungs are now gone, and Buick's long-term survival in North America is far from certain. While both mainstream brands and premium brands have been doing well, those in between have been struggling. In response, Chrysler has been shifting downmarket. Once a direct competitor to Buick, it now aims to be considered a mainstream brand like Chevrolet, Ford, Honda, and Toyota. Buick cannot do the same, as Chevrolet won't step out of its way like Dodge has stepped out of Chrysler's. Its cars must continue to command significantly higher selling prices than Chevrolet's or Chrysler's, but not as high as Cadillac's. Compare a Buick Regal GS to a Chrysler 200S, and the former is at least $4,000 more. What does it offer to justify this premium? More German than the Germans? Very solidly constructed, very dark. Why the 2014 Buick Regal? From the moment you first pull the door closed (with a deep thunk), the strongest impression made by the Buick Regal GS is that, from its interior trim to its body structure to its suspension tuning, it is rock-solid. You won't find a car that feels more German from any other non-German make. Perhaps this should come as no surprise, as the Regal was engineered and initially manufactured in Germany, where a nearly identical car is sold as the Opel Insignia. Production of North American Regals shifted to Canada a couple years ago, but the look and feel of the car were not affected. The new 2015 Chrysler 200 also has European roots, but Italian not German. It is also heavy for its size (these specs being close to the Regal's), and it feels solid, but not as granitic as the Buick. Also, its interior materials aren't as consistently high in quality. Unlike the larger, distantly related Buick LaCrosse, the Regal's instrument panel doesn't extend far ahead of the driver and the pillars flanking its windshield aren't incredibly thick. Perhaps Europeans expect to be able to see out of a car well, and the Regal was designed accordingly. The new Chrysler 200's instrument panel is deeper (though its design disguises some of this depth) and you sit lower relative to it. So the Chrysler 200 feels like a larger, less wieldly car than the Regal (partly because it is, but also due to its driving position). Other cars, such as the Ford Fusion and especially the aforementioned LaCrosse, distance the driver even more from the task at hand. Tall bodysides make the Regal appear as solid as it is. The new controls are laid out well, but could operate better. Aside from some buzziness when its engine is revved and some hum from the performance tires on concrete, the Buick Regal is a very quiet car. Beyond the low overall noise level, the quality of the sounds that do get through (with the noted exceptions) befit an upscale automobile. The Chrysler 200 is also quiet inside, but not as hushed as the Buick. The Regal has top scores in all of the IIHS tests except the new one for small overlap frontal crashes, where it hasn't been tested. Beyond this, the Regal GS is fitted with especially effective Brembo brakes. Brakes of this caliber are generally only found on much more expensive midsize sedans. Why Not the 2014 Buick Regal? As noted in the introduction, the Buick Regal GS lists for about $5,700 more than the Chrysler 200S even when the latter is optioned up to the former's higher base content level. With all-wheel-drive its starting price is over $40,000. Additional features account for about $1,400 of the difference, leaving a still substantial $4,300. Switch to the more luxury-oriented Chrysler 200C and fully load up both cars (pushing the Regal's sticker to $43,855), and the Chrysler's price advantage doubles. The Regal's relatively high price leads many people to wonder, "Why not just get a Cadillac ATS?" Well, a similarly equipped ATS lists for another $5,770. The Buick Regal and Chrysler 200 both weigh substantially more than just about any other front-wheel-drive midsize sedan. Add all-wheel-drive, and both weigh nearly two tons. Curb weight is the enemy of fuel economy. The Buick's turbocharged four-cylinder engine is more efficient than the Chrysler's V6, so it has an edge in the EPA's city test, 19 vs. 18 mpg. But the Chrysler's automatic transmission has three extra gears, for a total of nine, so it has the edge on the EPA's highway test, 29 vs. 27 mpg. The Ford Fusion, though far from light, has an edge over both: 22 mpg city, 31 mpg highway. Lower front fascia borrowed from Opel is aggressive yet clean. Tighter than the midsize average. The front bucket seats in the Buick Regal GS have larger side bolsters than those in other Regals, and these effectively provide lateral support in hard turns. But the center panels of the seats feel flat and overly firm. On some days even 20 minutes in the seat made for a slightly sore rear. The front buckets in the Chrysler 200S are cushier, but despite larger side bolsters than those in the regular 200 do not effectively provide lateral support. In both cars the headrest sometimes felt like it was positioned too far forward for comfort, but I have a more upright build than most people. Both the Regal and 200 have much less rear seat room than the average midsize sedan. Adults up to about six feet in height will fit, but with little room to spare. Both the Buick Regal and Chrysler 200 have clean, fluid exteriors with more than a little Audi influence. The 200's design is more dramatic, with a more coupe-like roof line, but its proportions aren't as good as the more subtly attractive Regal. Inside, the story is much the same. The Regal's interior styling is more tasteful, but less dramatic and perhaps overly dark due to the lack of anything like the Chrysler 200S's blue accents. The 2014's Regal's revised instrument panel design is cleaner, with fewer buttons. This dramatic reduction in the button count makes most controls easier to figure out and operate. But the new touch-sensitive mini-LCD HVAC and seat heater controls provide no feedback and can be slow to respond. At times I had to tap them two to three times to get a response. Some of these times I then got a larger change in the temperature setting than I'd intended. The upper part of the center stack, which includes a touchscreen, is too far away to reach easily, and buttons along the top edge of this screen tend to wash out in sunlight. In contrast, the Chrysler 200's controls are about as good as they get. With the 2012 and 2013 Regal, you could choose among four engines: a 182-horsepower 2.4-liter four-cylinder, a mild hybrid version of the same, a 220-horsepower turbocharged 2.0-liter four-cylinder, and, in the GS only, a 270-horsepower version of the preceding. Of the four, only the hybrid continued to the 2014 model year. The old base engine is gone, perhaps because the people who might opt for it are now likely to opt for the less expensive Verano. And both turbocharged engines have been replaced by a new generation turbocharged 2.0-liter four-cylinder good for 259 horsepower. In other words, the GS no longer has a diffferent engine than other Regals. The new turbo four makes the car fairly quick--figure about seven seconds to 60. But some less expensive competitors are quicker still. Of greater concern to me personally: the new engine buzzes and vibrates, surges and lulls a little in fairly casual driving. Given the GS's price, it should feel smoother, sing a more titilating song when revved, and be quieter otherwise. The Chrysler's 295-horsepower 3.6-liter V6 sounds much better, and is more fun to wind out. Update: If you'd prefer a manual transmission, for 2015 the Buick Regal GS is the only midsize sedan other than the far pricier BMW 5-Series to offer one in conjunction with premium features (leather upholstery, nav, sunroof). You can't get the manual with all-wheel-drive, though. As noted above, when the time comes to decrease rather than increase speed, the GS does have different brakes than other Regals. And its Brembo calipers are strong. In the GS, the regular Regal's conventional struts are replaced by "Hiper Struts" that eliminate torque steer (rarely an issue with all-wheel-drive) and keep the front tires more perpendicular to the road surface as they move through their travel, for superior composure and grip. The GS also gets adaptive dampers with three settings. In any of the three, but especially in "Sport" and "GS," the suspension feels tight and firm. "GS" should be reserved for especially smooth roads. The optional all-wheel-drive system includes a couple of electronically controlled clutch packs, one to shunt up to half of the engine's torque to the rear, which it more readily does in either sport mode, the other for the limited-slip rear differential. These effectively distribute the engine's torque to further enhance stability. Put all of these systems together, and the Regal handles with the sort of precision and composure usually found only in Europe's best cars. It doesn't have quite the same "damn the torpedos" tenacity when powering out of curves as some Audis, but this is more a matter of engine torque (the 2.0T's 295 lb-ft is good for a four, but no match for an S4's supercharged 3.0-liter V6) than the drive train and suspension. By any objective measure, the Regal GS handles very well. So why isn't handling about the reasons to buy the Buick? What the Regal GS doesn't do is involve the driver. The Hiper Strut suspension's geometry reduces the tendency of the steering to weight up as the wheel is turned. Whatever feedback makes it through anyway tends to get smothered by the overly padded steering wheel rim. The sport modes are supposed to firm up the steering, but I detected little if any effect. The Chrysler 200's suspension controls body motions well, but it doesn't feel as Euro-tight or as balanced as the Regal, its steering is overly heavy and somewhat vague, and its steering wheel rim is even thicker. Also, even though the two cars are similar in size, the Chrysler feels larger and less agile. Blame its heavier steering, deeper instrument panel, and lower driving position. 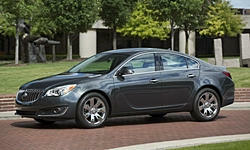 The flipside of the Buick Regal's tight and precise suspension is that it also rides very firmly. The upper two adaptive damper settings evoke some fairly sharp kicks on all but the smoothest roads. If this could be a deal-breaker, check out the regular Regal, with the same engine and interior but a more compliant suspension and a lower price. I haven't yet had the opportunity to drive the new Chrysler 200S on particularly bad roads, but it seems to ride more smoothly than the Regal GS. American driving enthusiasts, myself among them, have been begging General Motors and Ford to offer their European-market cars in North America for years. So I really want to like the Buick Regal GS. It's a thoroughly German car, offered by a domestic brand at a price much lower than the German makes would charge. And the Regal GS performs well, especially when the road curves. The problem is, despite (or even because of) its high level of competence, there's little joy to be had when driving the Buick. The Regal GS needs more personality. Ultimately, its strongest selling point isn't it's performance and handling, but its superior solidity and refinement. It feels like a top-quality car. This is easily worth $10,000 when part of one of those fancy brand sedans. But is it sufficient to justify a $4,000 to $5,000 bump on an "American" car without a prestigious badge? I'd like to think so. Perhaps too few people have even given the Regal a shot. Same engine as in other Regals for 2014. 14.2 cubic foot trunk nearly two cubes short of most, including the Chrysler's. Buick provided an insured car for a week with a tank of gas. Chrysler provided a car at a media association event. 2014 Buick Regal pros and cons, according to Michael Karesh: the best reasons for buying (or not buying) the 2014 Buick Regal. Join TrueDelta to post your own impressions. A write up of the non GS Regal with the same engine would be of more value to me. Don't want to pay for Brembos, etc. I drove the regular Regal a few times when it was new. Most of what I've written here still applies. The main changes are no Brembos and a suspension that isn't as firm, but still fairly firm. So a better ride/handling balance for most people, at a lower price. I currently own a 2013 Regal with the mild hybrid and love it. It isn't without drawbacks like the GS (tiny trunk, tight back seat), but it brings the quality and solidity with a more forgiving ride (and seats), and significantly improved fuel economy (I average 31-32 mpg on my weekly commute, sometimes reaching 37 mpg on the highway). It also costs a lot less than the GS, but still feels like a premium car. I bought a 2015 Buick Regal GS, and even when placed in positions to reconsider the decision, found nothing else even close to comparable for within $5000 of the price. I drove the Chrysler 200S V6, and wouldn't even place it in the same market, more similar to a Premium 1. Heavy people may find the GS seats confining. I like that feel and find the seatbacks near perfect. The thigh bolster could be a little longer, but that can be compensated with adjusting the seats properly. For alleged sport seats, the 200 seats try to look the part, but are too soft. The rear seat is similarly tight on both, but the 200's access is much worse. I have not needed to duck so much to get into the front seat of any mid-size sedan, and the rear seat is worse. The 200 is NOT a car for tall people. I think the 200 looks too much like a big Dart, where the Regal looks much more like European competitors like the Volvo S60 and Volkswagen CC. I don't see much Audi in either of them. I love the black interior in the Regal. FINALLY a car with an upper interior and headliner in black to match the dash (instead of grey). I think it is sportier and more dramatic than the 200 as a result. The blue accents are hideous, with only the bad 70's paneling patterned wood on the C models being worse. Disagreed on the 200's controls. The wiper controls are particularly poorly designed and I find the rotary transmission an annoyance. I find the Regal's very easy to use. The Regal GS also offers more complete instrumentation lacking on the 200. Also, do they REALLY need to say "Speedometer" and "Tachometer" on the 200? Annoying. I will grant the V6 is a highlight of the 200, and if you must have an automatic transmission, the 9-speed is good with a manual mode that really works. It is fun to wind out. However, the Regal GS offers a true manual transmission, and it definitely adds to the joy of driving and the personality. The GS is tuned for a broader power and torque curve than other Regal models. The soft handling and ride of the 200S shows it as a poseur, and strips any claim of sportiness from the car. With the luxurious C, FCA should have put a stiffer suspension package in the S models. In contrast, the Regal is eager to take on curvy roads way too fast for the good of your license points. I definitely feel the firmer steering in GS mode, and feel much more connected to the experience with it engaged. continued... Better tires than the Goodyear RS-A's that come on the 19" wheels should also greatly help the car's feel and communication. I intend to purchase some next spring. I wish I could set the car into GS mode as a default. For me, it provides the type of ride I want to experience on a sport touring sedan, and the best I have encountered on an OEM suspension anywhere near this price. Firm, communicative, and well controlled, it tells you what is going on. I would rather have a sharp, controlled motion than a queasy roll over them. The 200 suspension more wallowy and floaty, which may make for a smoother ride, but smoothness is not what one should seek in a car of this type. The trunk on both cars is modest to me, and neither rear seat folds for a flat expansion of the trunk. The 200 seemed to have a bigger hump, but both are significant. The 200 has no handle for closing the trunk, another detail miss. The interior of non-GS models is significantly different with different seats and gauge panel. Is the GS perfect? Of course not. The rear seat should fit a real adult behind a real adult on a car this size. There is no boost gauge, which should be on all turbo cars. The display wastes a space by putting two temperature gauges in it rather than an oil pressure or temperature gauge (both of which are selectable in the display). Cooled seats would be nice to have. It had to detune to not step on the ATS or CTS. However, it provides a true mid size sport sedan in the US market for under $40,000, filling in the gap between the plethora of compact sport models and the full size muscle sedans where nobody else will tread (Fusion ST, 200 SRT-6, anyone?). That to me is the biggest "WHY" the Buick Regal GS. It is a unique offering unmatched in the US auto market: a mid-sized performance model reachable by many average Americans. Thanks for the comments. If you haven't already, you should post your own review! See TrueDelta's information for all Sedans, Hatchbacks, and Wagons.